There are many reasons to add California native plants to your garden. Because they were “born” here, they are naturally attuned to our climate and soil. Consequently, gardening with natives reduces the need for summer irrigation and costly fertilizers that often run off and pollute our waterways. They also help maintain biodiversity by attracting birds, bees, and butterflies for pollination. This quick-growing deciduous shrub is a good choice for moist, sloped, part-shade areas adjacent to streams and creeks. It has a dense growing habit, with lush green leaves and scented red flowers that attract adult butterflies. 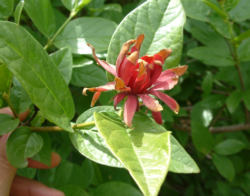 Spice bush is deer resistant and is also tolerant of our clay soils. When left to its own devices, it tends to maintain a tidy, well-groomed appearance year round, without a lot of pruning. Gardeners with semi-sheltered riparian landscapes can use spice bush to create a bright backdrop with a splash of seasonal color. Coffeeberry is native to California and southwest Oregon. This shrub has a lot to offer aesthetically and as a wildlife plant. It is clay tolerant, as long as it is not overwatered, and it is a good companion to oaks, happily accepting part shade. Atriplex can grow to 12 feet in width, providing a large dose of interesting foliage color. The branches are silvery blue-green, and they take on an almost otherworldly iridescence in the sunlight. The flowers and seeds provide seasonal food for birds, and the arching, sprawling growing habit of saltbush creates a refuge for wildlife. 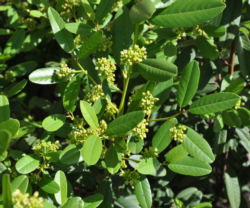 This plant is also referred to as quail bush, which makes sense, as the low canopy provides the perfect place for a covey of quail to run to for cover. Atriplex branches cut from the garden add an unusual foliage component to flower bouquets. 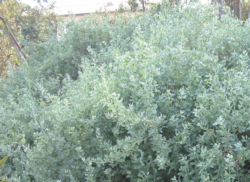 Saltbush needs no supplemental water once it is established. To capitalize on its size and unique color, pair saltbush with darker-leaved, drought-tolerant plants. The visual contrast is striking. 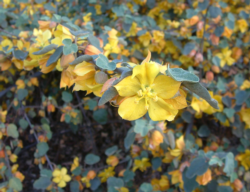 The leaves of the flannel bush are irregular-shaped and leathery-looking, a nice contrast to the showy, abundant yellow flowers that cover the shrub each spring. This shrub is best situated in an area where people aren't likely to brush up against it, as the leaves and seed capsules are covered with hair-like bristles that can irritate the skin. To support the birds and beneficial insects that will be attracted to these native plants, you might need to change your gardening habits a bit. When doing your autumn leaf clean up, leave some debris as shelter. Likewise, when pruning, be conservative about thinning native shrubs, allowing their natural growth habits to provide cover for birds.